Officevibe offers a continual feedback system to help promote better employee morale, increase productivity, and reduce turnover. On a weekly basis, Officevibe releases a new survey question to promote employee engagement in the workplace. The survey questions are quick, easy, and engaging. Unlike many other survey platforms, Officevibe’s surveys take about 5 minutes per week, a small time investment for a much larger potential reward. Rollout is easy — just invite your employees and everything else is handled by Officevibe. They automatically send survey emails at the optimum frequency, and reporting is always in real-time. The service is available online and can also be accessed via iOS, Android, and Windows smartphones and tablets. Officevibe provides a low-cost means for keeping employees satisfied and motivated. The platform is infinitely scalable, and is currently used by clients ranging from small start-ups to multi-billion dollar corporations like Microsoft. Microsoft uses Officevibe to promote team building activities and increase employee engagement in workforce tasks. 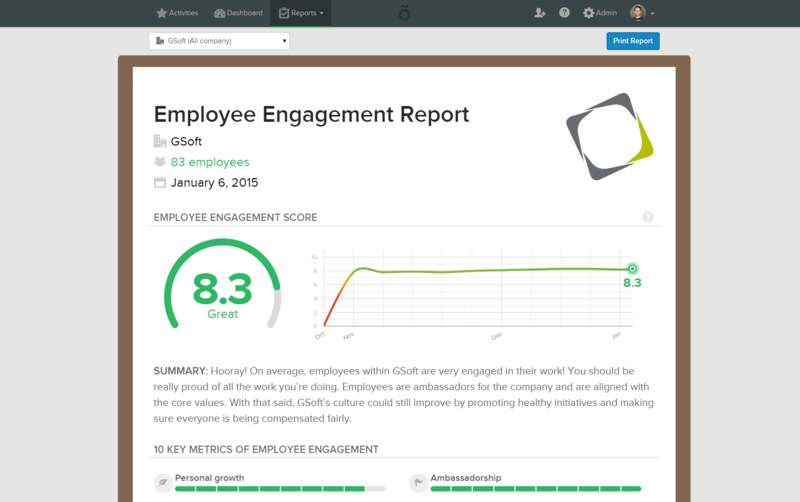 Since implementing Officevibe, Microsoft has experienced a notable increase in employee satisfaction and productivity. Review more of the top Gamification solutions with our Product Selection Tool. If you’ve got questions, call one of our unbiased Technology Advisors for a no-cost, no-obligation consultation about Officevibe and similar products. Learn everything you need to know about Officevibe. Our experts will reach out to you shortly.